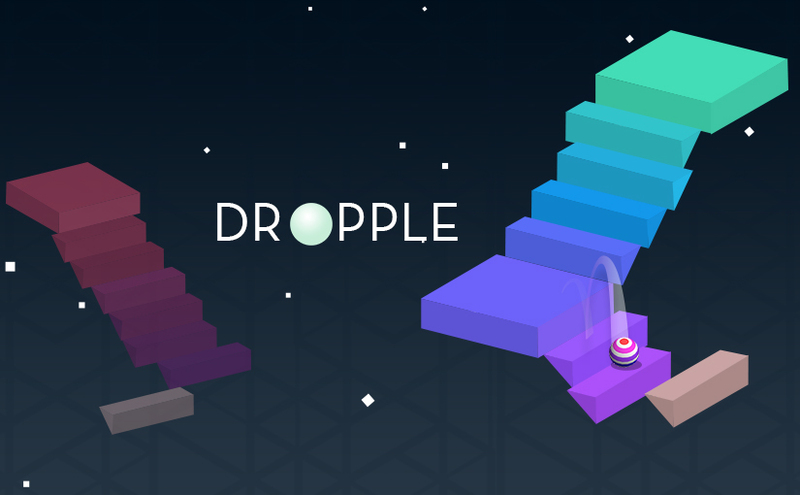 Dropple, the new exhilarating puzzle game has been launched in Google Play and the App Store and can now be downloaded for free! Set in a dreamy 3D world, the game lets you take control of a large staircase, arranged in such a way that a ball continues bouncing down the set of stairs for as long as possible. Following on from the concept of an earlier release Stairway, the game features a number of innovative concepts that will surely put you to the test and challenge you. Fast-paced and exciting, Dropple requires quick wits and a good gaming intuition. This article will help you get started and provide some insight into the best way to play Dropple. As you get better, we’re sure you will enjoy Dropple more and more! The steps move horizontally and your tapping the screen will set the in place. In the early phases of the game, your objective should be to line up one step with the one above it. This is due to the fact that you have more time to work with at this point. Later on, things get quicker and you might find it beneficial to tap multiple times in succession if you need a little buffer room between the step you’re working on and the ball. Sometimes it’s worth the risk. Social Networking and Online Score challenge! Dropple features great social gaming options with full integration with Google Play Games and the App store, allowing gameplay to be shared with friends and the rest of the world. Featuring a dedicated Facebook page, share and invitation option in the main menu, and 20 language options, Dropple has it all. You’ll also find a mute function if you want to listen to music or play in silence. Plus, be sure to check out the statistics screen to keep track of your progress. Here you can see your top score, number of games played, total score, average score per game and the time spent playing! Enjoy and don’t be afraid to post your high scores to our page once you get the hang of Dropple!